I am currently in a long distance relationship with my girl in Moscow, She is independant and we like to travel together. Together we are both looking at the big picture of marriage and kids etc, I have jopined this site to learn as much as I can from others experiences in dating a russian girl. I have flights booked to go and meet her mother in November and also to check out the city and surrounds of moscow, Anyone with tips or hints on where to visit during my 8 days there would be great. My partner owns her own appartment in Mytishchi so there is no plan on either of us relocating as yet however who knows what the future holds. Currently we normally just meet in Thailand every 3 months or so when our budgets allow, but I really want to visit and learn her world and culture. Next year we are plannning her first trip to Australia so she can meet my family, she has travelled extensivly so should not have a problem obtaining her tourist visa. So yeah thats me and our situation in a nut shell. Nice to meet you all and I hope to learn alot on here. I am looking for any advice and experience that can be shared mainly Australian blokes. At the moment my Russian girl and I normally meet in Thailand or somewhere in the middle where we don't have the visa issues. Now we are at the stage where she wants me to meet her family and I want to introduce her to my family, the only way we communicate with each others family is through skype etc, so would love to meet in person with them. Anyway I am hoping there is someone out there with similar circumstances as I have and I would like to learn from this. Sorry for the delay in replying to your post....... but I was away and I see, other people too! I am sure, from what I have noticed, on other posts, you had a good read around. If my memory serves me right it was another member, "Scotty", who was in the same position and he applied for a visa and he was granted one. I hope you follow the same route and get lucky and visit Russia, which will a very different experience from Thailand! Good luck and don't disappointed with the quiet atmosphere of the Board. Most members are married now and life must go on. I did read scotty's post and it gave me some hope in being granted my visa. Anya- My partner has told me it will be almost winter when I am there so going from +40 - -0 degrees will be quite a shock to the system haha. I am very interested in learning her culture and seeing the sites around Moscow, do you know any nice places that I can suggest to go in this weather? I want to surprise her and take her somewhere in her city that she hasn't been as I know she will be very surprised by the homework I have done before my trip. I really enjoyed reading through your love story postings they gave alot of helpful advice for me. I hope you and your wife are still happy and I am hoping myself and Anya will also get the chance to enjoy our journey as you guys. November in Moscow is not that bad, as you may think but a nice pair of gloves, a shapka and light boots and you will be OK. after all you are going for an adventure and I am sure, Anya knows where to take you and show you around the city. Moscow has now 3 very modern airports, and there is also fast train connection to the centre. Just try and avoid the Taxi drivers...... pain in the back as everywhere in the world. Despite that I have been to Russia, too many times to remember, unfortunately never stayed much around Moscow.... the other half was living 2 hours away, flight time, and only visited 3 very short times the centre and of course Red square. One of the best forums to read on this board, is the "Travel Report and Personal Experience" where you can learn a lot before travelling there. Unfortunately not many people these days write travel reports...... that is why the board appears very quiet. Most of the very enthusiastic "old guard" is married now and have other problems to take care but from what I see..... the visitors on a weekly basis keep coming to visit, over 1000, to my surprise. We all treat the board like our local pub! Take a look at these post and enjoy reading and seen his photos. Thank you for your good words. My wife and I still together, passed the cultural SOK ..... and looks she will have to put up for very long time with me! Wish you all the luck and I hope everything will go according to plan and you take some photos of the Red Square below. Do you or anyone have any tips on entry into the country? I have been issued a tourist visa so am not too sure on what to say if asked what I will be doing whilst in Russia and don't want to say that I am going to see my girl. I also don't want to say the wrong thing and be suspicious if that makes sense. Glad to hear that you got the visa and now you will be able to visit Russia and Moscow. On arrival and going through the Immigration is not a problem. Just fill up the immigration card and make sure you give the same answers for your accommodation. The russian officers..... are not very talkative! .... .... so do the same. Just give your passport and the Landing card.... and smile! I am sure you will be met by your girlfriend.... so she knows what to do and how to travel around..... avoiding the taxi drivers.......who are the same like any other one around the world.......rip off merchants. Do not forget to register with OVIR...... police. If you stay in a hotel..... they will register you arrival..... but if you stay with your girlfriend.... in her flat, then, you both can do it.....in the Post office or......at the OVIR office. The application is written in Russian so... she knows what to do.! I am sure you will have a great trip Daz. 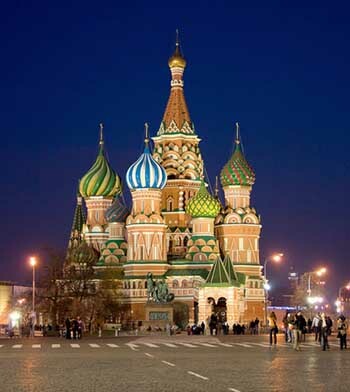 I have been to Moscow around 15 times and love the city. There may not be much there that she hasn't seen but I am sure she will enjoy showing them to you and will be a great tour guide for you. 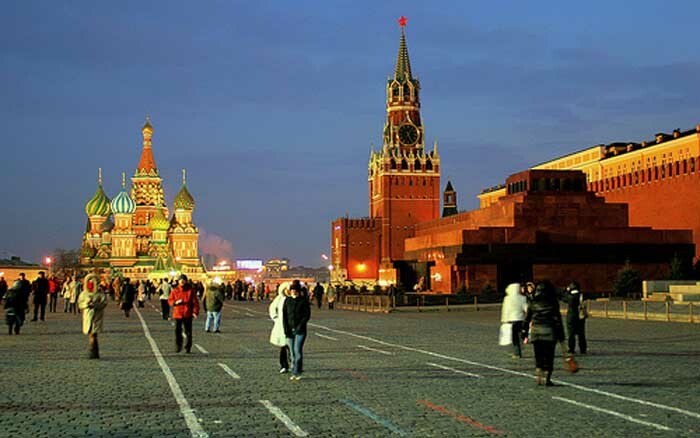 The number one thing on most peoples tour of Moscow is of course the Kremlin and Red Square. For me, having seen it so much on TV and in Movies I found it awesome to actually be there. In the Kremlin the bell and the cannon are really neat. Many enjoy wondering around GUM which is a block long shopping center dating back from the Soviet days. There is a more modern shopping center right near the Kremlin. Gorky Park is talked about a lot but in the winter won't be an option and really is more like an amusement park from the 50's in other parts of the world. The Zoo there is not very impressive but might be worth a visit. The thing that I really enjoyed was the Moscow Circus. It was terrific. One of the most talked about things is the Bolshoi Ballet which is worth seeing. Those are the things that come to my mind at the moment. Thanks for your advice with this I have found this forum and all conversations very helpful. I will do as you say when going through immigration and will register as soon as possible with the OVIR with Anya as yes all paperwork is in Russian, Mind you my Russian is getting a little better and can speak a very basic conversation with her mother for her birthday the other day which she was very impressed haha. I studied this conversation for a week to get it right haha. Anya has already made an itinerary of places for us to visit however I am hoping to find a nice steak house whilst there if anyone can point me in the right direction that would be great. I will take pictures to post later and will always come to this forum when ever I need help from seasoned Russia travelers. Wow 15 times to Moscow, I am hoping to travel there as often as possible as I am very interested in the history of the country. I will check the GUM shopping center, Circus & Ballet. I live in sunny Queensland Australia so am finding it hard to find a place that sells extreme winter clothing that will be suitable for the temperatures over there. So will more than likely do my shopping there on arrival if I don't die from the cold before we get there.